English covers many areas: Spoken language, Reading, Writing, Spelling, Vocabulary, Grammar and Punctuation and includes drama and social skills. English skills are also taught though other subjects, e.g. History or RE. Children are introduced to books as soon as they enter school. We want them to develop a love of reading, as well as to achieve excellent reading skills. Our main reading scheme is Oxford Reading Tree, supported by a wide variety of other schemes to provide an individualised reading programme for the children. This includes the X Project which is really appealing to boys. Children take books home to share and read with parents. All children use the School Library and there is a lending library in each year group. Parents help run these. 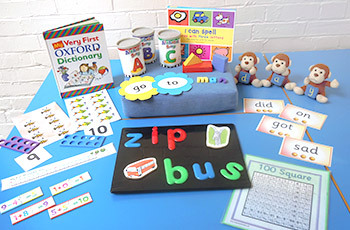 We teach Phonics from the start to help children develop confidence with word attack skills and to support spelling using the Governments Programme Letters and Sounds. We also have a spelling scheme of work and run regular workshops to enable parents to help their children. Children are taught to write for a range of purposes, e.g. invitations, letters, lists, in sentences with correct punctuation and learn the importance of correct spelling. The school teaches the ‘Look, Cover, Write, Check’ method of learning spellings. We follow a structured Handwriting Scheme and when children have mastered correct letter formation they are taught how to join the letters. Parent Workshops are provided to help support children at home.